Rana Daggubati to star in a biopic? "DMD" presents the other side of GOA and in what a way...Simply stylish with all the glitz in place.The plot of the movie is ACP Vishnu Kamat(Abhishek Bachchan) is assigned a task by the GOA CM to clean up GOA coz Drugs is the reason for all the illegal things in GOA(Mafia,Rave's ...etc).Vishnu on the other side has his own demons to deal with.With his choice of lieutenant's Vishnu goes on a spree to Clean up GOA and free the place from the menace and the ball starts rolling. The first half presents the sketches of all the characters.Lorry(Pratiek Babbar) is shown as a student who gets in the drama for his love and professional life. And Joki(Rana) who has some Unfinished business with Lorsa Biscuta(Aditya) gets involved because of his love for Zoe(Bipasha).The 3 crosspaths at GOA Airport where Lorry is caught for possession of Drugs.Joki tries to convince Kamath of Lorry's innocence and helps him just to prove Lorry's is a small fish in the pond. The second half has Kamath looking out for Michael Barbosa.The second half is where the Movie falters from being a good one to just finishing Above Average.The pace just dips a tad due to unnecessary addition of some shall i say...Foolish scenes.It all boils down to finding out the Saviour of Mafia's >Micheal Barbosa in the end and the outcome is not convincing after building up intensity which just dosen't Blow-Off. The background score of the movie is set according to the feel of GOA which is catchy. Abhishek Bachchan in top form(after a long time) playing ACP Vishnu Kamath and plays the character with utmost ease which only he can do.Aditya Pancholi as Lorsa is the perfect Baddie.Pratiek,Bipasha and Rana do fairly decent job,but Abhishek Bachchan Steals the Show in this one. 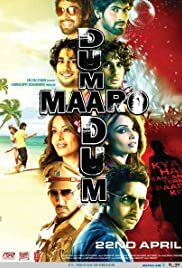 Watch DMD for 3 reasons: 1.A good flick after a long time 2.Entertaining COP-Mafia Thriller. 3.Abhishek Bachchan(who's in TOP Form..).